Just short of its centenary, the Fokker Eindecker still inspires the imagination as arguably the first true fighter in history, which more than any other aircraft defined aerial combat as we still know it to this day. The successful introduction of the interrupter gear allowed the Fokker E.I and the following types a period of air superiority from the summer of 1915 until early the next year, during which they wrought havoc among their virtually defenseless Allied opponents. The Fokker E.II and E.III were built simultaneously and both bore the factory designation M14, capitalising on the success of the E.I with the adoption of a more powerful 100hp Oberusel U.1 engine. Quite what the differences were between the E.II and the early production E.III is a matter of some debate among historians. While some sources state that different wings were fitted, the latest findings by Josef Scott, as outlined in his Fokker Eindecker Compendium (see below), indicate that they shared the same 10.05m wings with a chord of 1.81m. In his opinion, the changes were largely internal, making it all but impossible to determine whether an airframe was an E.II or an early E.III unless the Arméenummer is known. Moulding quality is very good, with no traces of sink marks or flash on the review sample, and any ejector pins marks seem to have been tucked safely out of sight. Slightly disappointing on the review sample, though, is minor warping of the wings where the sprue has presumably been removed from the mould a tad too soon. Hopefully, this may not be present on all examples, but the solution is quite simple - a careful dip in very hot water and gently flexing of the parts until they are straight, then leaving them to cool being all that's usually required in such cases. The exterior finish is excellent, comprising neatly engraved panel lines and delicate raised details such as fasteners and the walk-ways on the wings, along with a beautifully subtle taught fabric effect on the wings and tail surfaces. There are no rib-tapes - instead, the wings feature lightly represented split cane strips that pinned the fabric on the original. As with the DH.2 kit that WNW released simultaneously, some of the parts are extremely delicate and need very careful removal from the sprues - particularly noticeable here is the wonderfully fine cockpit framework (which incidentally demonstrates how hopelessly clumsy similar parts in many other manufacturers' kits are). The fuselage slots together neatly with just three locating pins. The top seam is quite long, so you may wish to add a supporting strip of styrene inside. There's no locating pin at the front (the cockpit floor leaves no room for one), so using a fast-drying "hot" cement might be a good idea to ensure it's lined up correctly before you move on. The top decking ahead of the cockpit fits well - but a point to watch out for is that the sprue locating tabs merge rather indistinctly with a pair of raised pips that you DON'T want to trim off (guess what I did in cleaning up the parts rather too hastily for this review...). The wings are lovely and thin with nice sharp trailing edges. I was keen to see how WNW have engineered things to support them, and the way they've done it is rather neat - while visible part of the cockpit framework is very delicate, as noted earlier, out of sight behind the aft bulkhead is a substantial mounting jig that traps a pair of hefty rear "spars" on the wing panels. (Interestingly, the side-frames also feature a second pair of slots for the earlier "shoulder-mounted" wing - giving a foretaste of what WNW have planned for future releases...). The 28-part cockpit is very nicely fitted out without being overly complex. The side-frames, floor and rear bulkhead/support clip together neatly to form a robust assembly that slots solidly into the fuselage. The frames include tiny rigging attachments, and careful study of the instructions' excellent archive reference photos will pay off if you wish to add the prominent turnbuckles. The 2-part seat features a nicely done leather cushion, and a full etched harness is included. The interior cockpit instrumentation is minimal, comprising little more than a tachometer and side small panel mounted onto the ammunition box. Pin-sharp decals are included for the instrument faces, custom-printed by Cartograf with virtually no excess carrier film, so application should be a breeze. Full colour details are given for each item, but a point worth noting is that the ammunition box is merely described as "Aluminium", whereas contemporary photos clearly show it was finished like the exterior cowl panels and firewall in a "turned" effect. WNW suggest a simple method of replicating this effect among the Hints & Tips on their website. Note: It's probably a fair assumption that the metal section at the front of the floor should also be finished this same way. The dual -purpose Gnome Monosoupape / Oberursel U.1 engine sprue is identical to that provided with the DH.2 - the only difference being that the side-mounted spark plugs need to be trimmed off this time and alternative push-rods used to replicate the Oberursel. In fact, the remaining spark plugs represent something of a compromise due to moulding limitations; they are positioned pointing straight out of the rear of each cylinder, whereas the originals were angled to one side. Purists may want to replace them entirely (although simply bending them carefully may suffice), but they will be tucked out of sight to all intents and purposes anyway, so the finished motor should look excellent. The undercarriage is made up of 3 main parts, and the front legs attach to the base of the cockpit floor to give a good, strong foundation. There's a bit of play in how the struts fit, so follow the instructions carefully to ensure the sub-assembly is set at the correct angle to the fuselage. Also note that the wing-warping mechanism most be set cocked to one side when in the neutral position. The wheels are very nicely moulded, with delicate lacing on the covers and raised manufacturer's details on the tyres. The engine cowl features a moulded-on blast-plate under the muzzle of the machine gun, along with an optional etched replacement. The latter is much superior and well worth fitting if you are confident working with metal parts, as the plastic version looks very soft by comparison. One minor bugbear with the cowl is the positioning of the top sprue attachment, right on the delicately moulded retaining strap; inevitably, cleaning up the stub loses some of the detail, which could be restored with a very fine strand of stretched sprue. It's time now to fit the wings and tail, and it's here that you run into possibly the trickiest part of the kit. Because the wing parts also double for the E.III "Late", the starboard wing includes the prominent external compass that was added either during or after the 400-435/15 production batch. It sits perilously close to surrounding details, and I have to say I can't help wishing WNW had found a way to include it as a separate part, rather than necessitate such delicate surgery. With it placed right on the top of the wing next to the cockpit, there's not much scope for hiding any damage if you do mess up (although the kit does include a rather cute little teddy bear mascot which could be sat there as a distraction)... Also required at this stage is a simple cut at the wing root to clear the early-style ammunition storage. With the wings attached, the instructions now turn to the lMG "Spandau", which is nicely detailed and provided as both a solid all-styrene version or with a choice of 2 styles of etched cooling jacket. A delicate etched "gate" gunsight is also provided for the etched version - but, of course, you could also attach it easily enough to the solid one. There's a separate recoil booster which is actually marked as "not used" on the instructions, but is clearly evident in shots of some E.IIs and E.IIIs (as are alternative style sights which are also included on the etched fret) so, as ever, check your references. Among the final details, WNW have included a rarely seen headrest for one of the colour schemes, and a very neat touch is the way they have designed the cabane struts complete with the rigging attachments in situ at the correct angle. A crystal clear windscreen is provided - but a quick look at reference photos shows the original soon become so filthy, it was often little more than translucent, so ironically you'll probably want to knock back that beautiful clarity. There's an optional anemometer and flare gun and cartridges, and the last items fitted are a choice of beautifully moulded Germania and Garuda propellers. Decals are provided for the manufacturers' logos on both styles. A full page of rigging diagrams is provided . Although they're pretty clear, I thoroughly recommend studying the excellent scale drawings included in Albatros Productions' "Fokker Eindecker Compendium 2" and the 1:32 reproductions in the latest edition of Windsock Worldwide, which really do help clarify things even more. No turnbuckles are included in the kit so, again, careful study of reference photos is recommended if you want to add these (Note: according to Windsock, the full-sized turnbuckles were colour-coded, which will add a novel point of interest). As usual, WNW's "vintage-look" instructions are excellent, combining colour-shaded diagrams with numerous notes and very helpful reference photos. Painting suggestions are keyed to each detail as construction progresses, and the colour chart includes matches for Tamiya, Humbrol and Misterkit paints. A: Fokker E.II 33/15, Otto Kissenberth (20 victories), Eduard Bohme (2 victories), FFA 9b, January 1916. B: Fokker E.II 36/15, Ernst Freiherr von Althaus, KeK Vaux, December 1915 (9 victories). C: Fokker E.II 68/15, Lt Bruckmann, AA Gaede, late 1915- early 1916. D: Fokker E.II 69/15, Kurt von Crailsheim, FFA 53, October 1915 (1 victory). 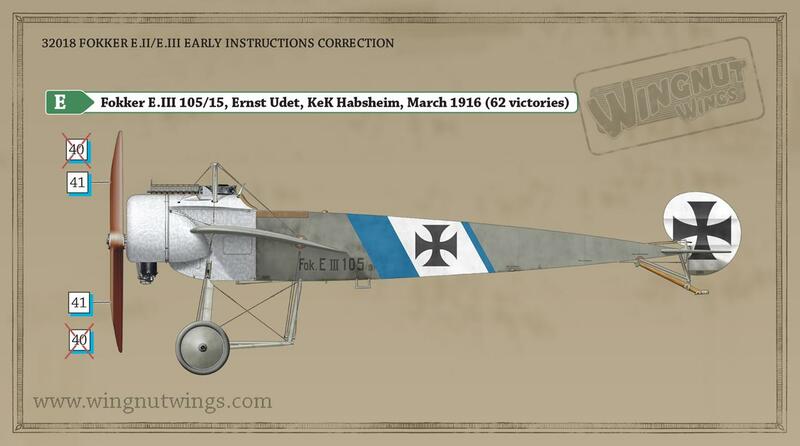 E: Fokker E.III 105/15, Ernst Udet, KeK Habsheim, March 1916 (62 victories). As usual, the Cartograf decals are quite superb, with the thin, glossy items showing great registration and colour depth. They even include an effect I've not seen before - deliberately faded serials for two of the schemes. Compared with the late-production E.III (kit # 32048) released alongside it (see Stephen Lawson's fine Review HERE), this kit offers arguably more attractive colour schemes with some prominent fuselage bands to break up the otherwise monotone finish. Exactly what that finish was is a matter of some debate, with contemporary accounts of the basic colour of Fokker Eindeckers reporting everything from yellow, through beige, brown and grey. One thing is apparent though - study of photos of aircraft in service appears to indicate that none were finished in classic translucent clear doped linen, and it's suggested that a course, opaque fabric was pre-dyed prior to application. But equally some machines appear to have (re-)painted at some point, so there's plenty of scope for variation. WNW suggest "Fokker Beige" and "Fokker Grey", but don't dismiss the apparent simplicity of the colour schemes as being dull, since portraying the extensive streaks and patches of castor oil staining often visible will offer a very interesting challenge. This is another superb kit from Wingnut Wings, and while it's comparatively simple compared with the DH.2 that was released simultaneously, it's equally packed with detail. Thanks to WNW's excellent engineering, construction should still be quite straightforward, making it a very attractive subject for newcomers to WW1-era modelling. Unreservedly recommended. Highs: Beautifully detailed. Excellent decals. Comprehensive instructions and references. Lows: Wings slightly warped in review sample. A rather delicate modification needed for this version. Verdict: Another great kit from WNW. Packed with detail, yet quite straightforward in construction. Here is an errata page on this kit from WNW.